Fire Lieutenant Kevin C. Dowdell died in the World Trade Center on Sept. 11, 2001. He was one of 18 Ancient Order of Hibernians members from New York and New Jersey who lost their lives that tragic day. 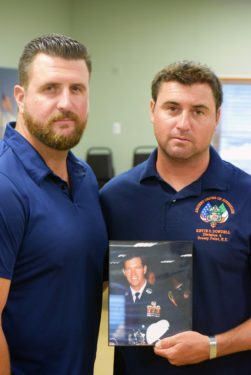 A devoted husband and father of two sons, Lt. Dowdell lived in Breezy Point and served at FDNY Rescue 4 in Woodside, considered one of the city’s most elite firehouses. He took great pride in his job and was not considering retiring even though he had 20 years on the job and was eligible. He received many citations during his career with the New York City Fire Department. He received a medal for his rescue of a woman from a Queens diner after it had exploded and collapsed. He also went to Oklahoma City as a member of FEMA to help with the recovery of victims after the Murrah Federal Building was bombed in 1995. As the 17th anniversary of his death approached, male relatives and friends started a new Ancient Order of Hibernians division in his name in Breezy Point. The Irish Catholic fraternal organization seeks to promote friendship, unity and Christian charity among its members and the wider community. Established in February of this year, the Lieutenant Kevin C. Dowdell A.O.H. Division 4, already has over 50 members and continues to grow. Among the members are Lt. Dowdell’s sons James and Patrick. Almost all of the men belong to Blessed Trinity parish in Breezy. The group formed not only as a way to honor Lt. Dowdell and all of those who died in the Sept. 11, 2001 terrorist attacks, but also to continue the values of community and faith which the fallen firefighter held so dearly. “He always told us about the importance of community and he loved Breezy. He loved these people and always wanted to help and do as much as he could,” said James Dowdell, who was only 17 when his father perished. He decided to follow in his father’s footsteps and now serves as a firefighter in FDNY Rescue 2 Company in Crown Heights. He is proud to carry on the values his father shared with him. “He was a great man and father and we hope to continue to share his beliefs and values within the community. He meant the world to us and we will never forget him,” James said. For Patrick Dowdell, losing his father at age 18 was a defining moment in his life. It gave him the courage to attend the U.S. Military Academy at West Point and serve his country in Afghanistan. Patrick said the Breezy community was quick to respond when the new division was being formed in his father’s name because ‘He was loved here,” he said. 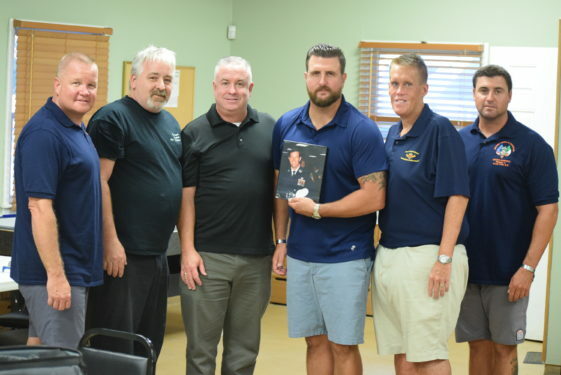 Joe Duggan, Patrick Lyons, Dave Carey, Patrick Dowdell, John Manning and James Dowdell are just some of the members of the new Lt. Kevin C. Dowdell A.O.H. Div. 4, at the Breezy Point Catholic Club. John Manning is the New York State secretary for the Ancient Order of Hibernians and serves as president of the newly formed division. Manning said that the division started with 20 members and in just a few months, membership has more than doubled and continues to grow. “These people want to be involved and want to continue to build a better community. We have come together to honor a hero and to continue sharing the values of friendship, community, and Christian values,” Manning said. F.D.N.Y. THE GREATEST FIRE DEPARTMENT IN THE WORLD! I AM A 15 YEAR EX. N.Y.P.D. AND HAD PLENTY OF EXPOSURE WITH FIREFIGHTERS, PARTICULARLY IN BROOKLYN. MY PARENTS HAD A MEMBERSHIP AT THE BREEZY POINT BEACH CLUB IN THE 1950S, A GREAT NEIGHBOORHOOD! GOD BLESS ALL THE MEMBERS OF NEW YORKS BRAVEST, AND MAY ALL DECEASED MEMBERS R. I. P.
The Dowdell family is very special to us folks here down in Georgia. We did not know Lt. Kevin Dowdell but we know the family. My wife reached out to NYFD fire houses after 9/11 and through links with other fire fighters and her research contacted the Dowdells. We feel privileged to know the family, every bit a wonderful as you could imagine. The Dowdells are patriotic Americans and the best of us.